You’ll notice that these docks are angled so the bikes take up a minimal amount of sidewalk width — to my eye it was about four feet, maybe a little less. Relatively few of the stations are going to be on sidewalks, but this should help preserve precious space for walking. When the light turns green, you lift the bike up slightly by the rear wheel, and you’ll feel it release from the dock. 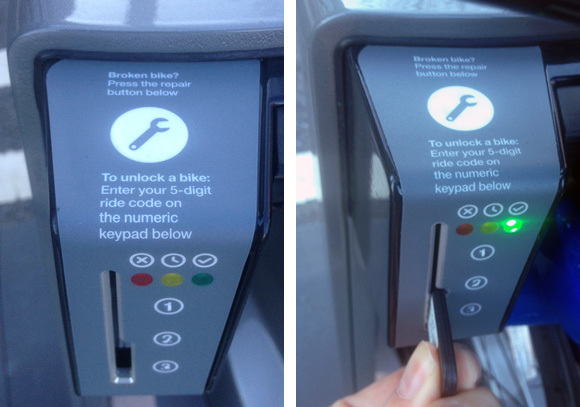 The instructions about entry codes refer to the way weekly or daily users, who don’t have fobs, would unlock a bike. If you’ve used bike-share in DC, Boston, or Minneapolis, I don’t really have any news for you about how these bikes ride. They’re basically the same sturdy three-speeds that the Public Bike System Company makes for those systems — a “two-wheeled tank,” as BusinessWeek put it. The riding position is upright, with a slight forward lean. A twist of the right handlebar will shift gears. Second gear was fine for the mild rises and downhills in the Navy Yard. I tried out a few bikes and they all pedaled smoothly and braked crisply. So who wants to make a short video about all that? A few more notes about the stations. 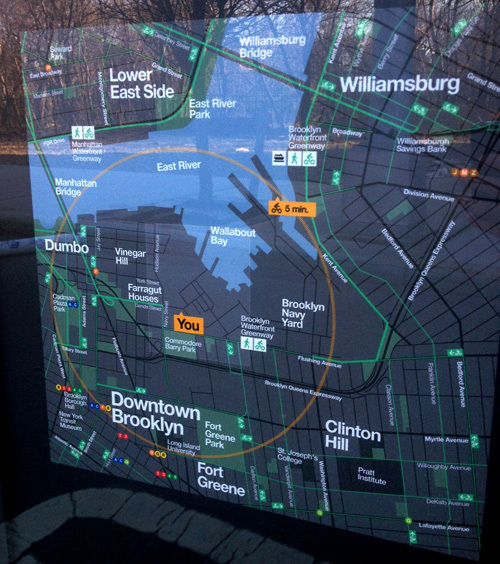 On the side of each kiosk that faces away from the bikes, there are two maps that will be helpful to anyone who’s trying to orient themselves, not just bike-share users. Inside the service area, this is going to be the most accessible wayfinding system around (other than asking a New Yorker for directions). Now here’s my eyeball estimate of how many cars you can fit in the same area. I like the angled station. That could be nice for some locations. We don’t have those in DC. i love this cameo spin report. i hope they really deliver this by may. i cant wait to sign up. its going to save me time and money. no more need for unlimited metrocard when i can now get unlimited (45 min) rides for $100/year plus im not restricted to rails. The useful-looking maps are something I hadn’t anticipated. They’ll add greatly to the substantial & “community-sanctioned” feel of the stations, and I’ll bet the stations will consequently become gathering centers for all kinds of “desirable” locals and non-locals looking for where to go next, even those not (yet) using bike-share. Exciting stuff. It’s cool that NYC is really trying to push the envelope on how to make this type of system work best in the urban environment. 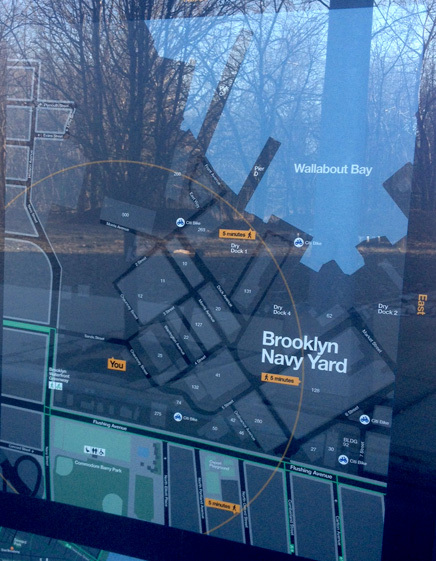 Angled docks for sidewalks is a really smart idea, and the wayfinding maps look top notch. I do find it odd that bikeshare stations aren’t shown on the more zoomed out map. 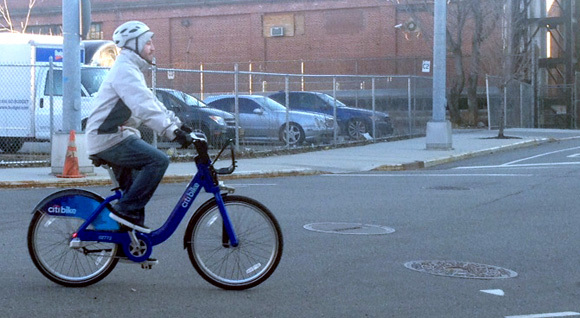 Most people probably won’t be using bikeshare to go to locations within a 5-minute walk, so it would be helpful to be able to see stations near destinations. I guess it doesn’t matter so much if you have highly visible stations every few blocks. I guess we’ll just have to wait and see how well it works when it launches next month. I had the same thought about putting bike-share stations on the map. One potential reason not to include other stations is that they’re probably going to shuffle stations around a little bit, even after the launch. It may make sense to hold off on committing to maps with that information until the station locations are settled. Do you know when this system will launch? It was supposed to launch in March but it got pushed back. I hope it comes out soon because I really want to try them out. It will be the biggest system in America and one of the biggest in the world. NYC is moving in the right direction! And not that every user will have a smartphone, but apps like Spotcycle will negate some of the immediate need for printed or posted maps. Its going to be fail…. look forward for next year if they have not have yet fixed the bugs. That’s a good point. Stations are shown on the zoomed in maps,though, which will need to change alongside any station reshuffling. I suppose by only showing station locations on the more zoomed-in maps, for each station that is moved, fewer maps need to be replaced. The only bugs now is having enough of the kit on hand for NYC, and enough personnel to get it installed for a good launch date. Isnt this supposed to launch in three weeks? In Boston, theyre only able to install, at best 25 stations a week. This is looking more and more like yet another delay, and the facebook page is complete silence. Actually, speaking of installations, on my street in Bed-Stuy, Monroe St., I saw DOT No Parking signs taped to trees and cones marked “NYC Bike Share.” I wonder if that means there will be an installation on Monroe this weekend? Here they come, Brooklyn! Will each station have open docking spaces to start? What if I ride somewhere and the docking station is full? And I assume you need your own lock if you want to run into somewhere where there isn’t a docking station nearby? These are all typical operating parameters of similar bikeshare systems. Bikes will be transported around constantly to rebalance the system but you’ll occasionally find a full rack when you want to return (or empty when you want to leave). Similar systems let you extend your borrowing time for free when you encounter a full stand, and the interface will list nearby stands with accommodation (and there will be smartphone apps too, which already exist for other systems). And yes, if you want to lock up at somewhere other than a bikeshare stand, you’ll need your own lock. Paris is the only system I know that has an integrated lock for this situation (and the old Berlin system, but that operates differently today). Really, really looking forward to this. If I use it half as often as I think I might, I’m going to be on it a lot. Thanks for the preview! 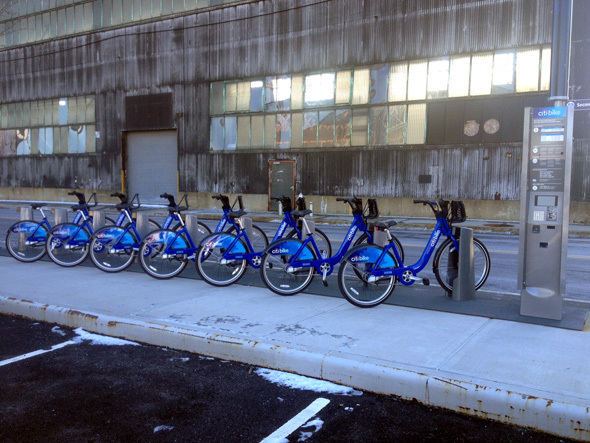 They will spread the bikes out so each station starts about half full. 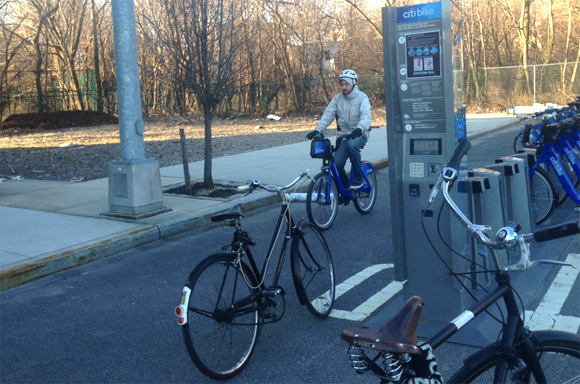 There are smartphone apps that tell you in real time where there are bikes and where there are open docks. The stations are spaced closely enough that a full station isn’t that big an inconvenience. And unlike other cities, new York has travel patterns that are distinctly un-correlated. Lots and lots of people will be cancelling each other out all the time, unlike DC, where full and empty stations are a big problem. The minneapolis bikes had build in lights that were lit by pedal power. Do we get the same? yes, they’re visible in the second-to-last photo. the red spots where the seatstays and chainstatys meet. Why wouldn’t these stations be installed on the sidewalk? Citi is also charging a fee (high fee $100 to register, $10/ 24hrs, plus exorbitant late fees and $1000 if the bike is stolen??? 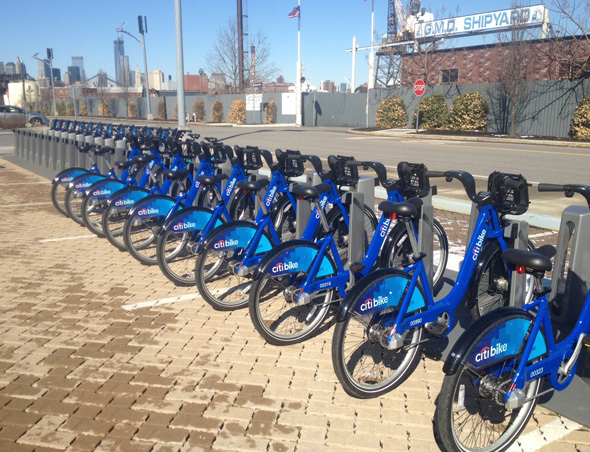 ?, how could this for profit bike sharing program be put in the city streets taking up free public parking? Why *would* they be installed on the sidewalk? We allocate way more space to cars than pedestrians as it is. We have same bikes in Montreal. 5000 I believe. Fantastic idea that’s been popular for years. Too popular maybe as main complaint is lack of bikes or empty slots.